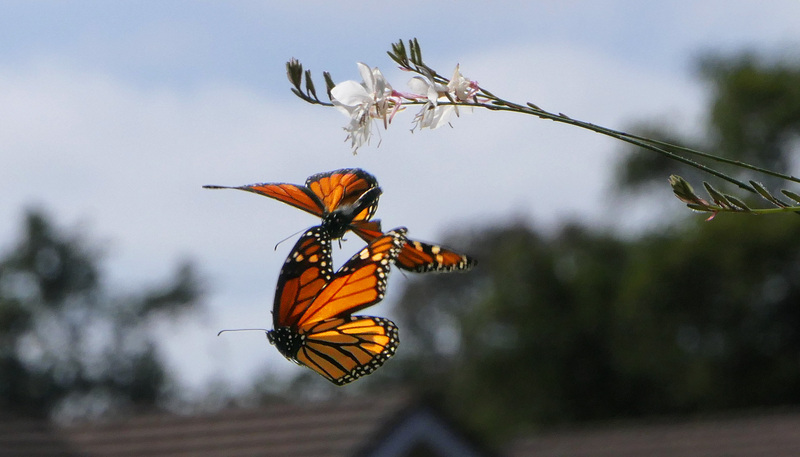 Like sunsets, I could take pictures of Monarch butterflies and post them every day. But I need an excuse, so yesterday’s project was to catch butterflies in flight, which is damn near impossible. I quickly decided that the only way to do it was to prefocus on a spot and fire off a burst every time they came near. Then go inside and see if I got anything. My spot was the flower below, which was poking out into the sunshine. I don’t think I ended up capturing a single picture of the butterflies that was truly in sharp focus, but this one is pretty close, and by good luck it includes both the butterflies that were fluttering around in a mating dance. Enjoy.